It is impossible to arrange all the collected material on this trip in the analysis of the stories. Sometime the material is too comprehensive, sometimes it is only an anecdote or a peculiar experience, sometimes it is only indirectly connected with the analysis. That is why I decided to store some of the material in this "travel log", as a completion or a supplement on the information on the main WebPages. Therefore this travel log is not classified by title of the novels or stories but by locality. Analyzing Simenon novels to find out more about the localities and the places where the stories are set, is a gripping activity. Especially so because the author tends to stay very close to the actual situation of the sites and the circumstances. It is exciting to search and deduce, to find the hints and traces in the text, to map out the information and to draw the conclusions. But at the end, when the text is written and when the photo-material is collected, the WebPages are edited and published on the internet, the question always remains: Am I right? In most cases there is only one way to find out... going on the spot! And that is what I intended to do for a long time. I dreamed about a journey trough France. A trip of three or four months to visit all the sites and locations. But it became clear that this would stay a dream. Going away from work, kids and family for four months seemed after all not so down-to-earth. Last September, 2003, I saw the opportunity to draw myself away from all worries and responsibilities and I took off for the beautiful country of France, for three weeks. I knew I couldn't visit all the locations in this period of time so I selected a more or less logical part of the country to start with. 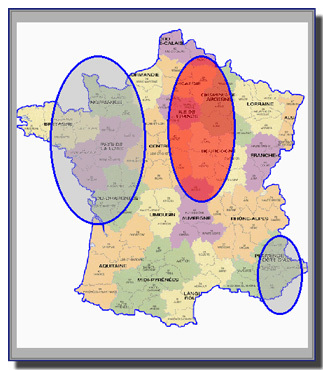 If one sets out the different locations where the Maigret stories in France are set, on a map, it occurs that there are three main geographical groups or areas. The most extensive group is situated on France's west coast. From Dieppe through Normandy, Brittany and the Vendée in the south. And at last the central part of France, starting in the north on the Belgian border with Givet over the direct vicinity of Paris, the Marne, Seine and the Loire rivers, which play an ever returning role in Simenon's work, and ending in the south with Vichy. I choose to start with the center. I live in The Netherlands, but very close to the Belgian border (in fact, I am Belgian, from Antwerp, the nicest city in the world!). Givet in the north of France would be the first target-location (This can give people from outside Europe maybe a notion how small Belgium is: From my home in the Netherlands, from north to south through Belgium, to Givet in France, is only a two hour drive!). This trip was a revelation. I know France pretty well, but when one travels with a specific goal in mind and visits places that are not #1-tourist attractions, the country gets a whole new dimension. I discovered an entirely different side of France. The small villages, quiet, rustic. The people sometimes untroubled and chatty, sometimes a little hostile and suspicious. The region directly south of Paris, frantic and chaotic, sometimes hideous, poor and overpopulated. The normally unnoticeable gradual transition from the North to the South. The gradual change of mentality, of accents, of customs in food and drinks, architecture. The change from fretfulness to complacentness.